Mcgregor, Nancy et al. "Hart House". The Canadian Encyclopedia, 04 March 2015, Historica Canada. https://www.thecanadianencyclopedia.ca/en/article/hart-house-emc. Accessed 25 April 2019. The Gothic Revival style Hart House (photo \u00a9 by James Marsh). Conceived by Vincent Massey as a university social, cultural, and recreational centre whose members 'may discover within its walls the true education that is to be found in good fellowship, in friendly disputation and debate, in the conversation of wise and earnest men, in music, pictures and the play, in the casual book' (excerpt from The Founders' Prayer). Designed by the Toronto architects Henry Sproatt and Ernest Rolph, and located on the University of Toronto's St George campus, this gift to the university from the Massey Foundation opened 11 Nov 1919. It was named for Hart Massey, grandfather of Vincent. Membership was limited to male students, graduates, and faculty members until 1972, when women were admitted. Hart House's facilities include the Great Hall located in the East Wing which functions as an event venue, conference centre, and concert hall and houses a Steinway grand piano. The Music Room in the West Wing also boasts a grand piano, and is used for smaller concerts, lectures and events. The Theatre with its proscenium arch is located underground, and there is a large fitness/athletics complex. Besides other rooms for meetings and student use, Hart House houses an Art Gallery, and owns a farm located in Caledon used for retreats and recreation. All students at the University of Toronto are members of Hart House, and alumni of other universities may join for a fee. Activities at Hart House have been co-ordinated by committees of students, graduates, and faculty, and by various clubs, all of which report to the Board of Stewards chaired by the warden of Hart House. Most music events are arranged by the music committee. The relationships of the Hart House Glee Club, the Hart House Orchestra, and the Hart House String Quartet to Hart House itself are described in separate articles. Series of recitals, and of Sunday evening concerts in the Great Hall, long-standing traditions at Hart House, were initiated by the second warden, Burgon Bickersteth, and by J. Campbell McInnes. The first Sunday evening concert, 12 Nov 1922, featured the pianists Reginald Stewart and Colin McPhee, a 30-voice choir, and a six-piece instrumental group conducted by McInnes. Other performers over the years at these concerts have included the Festival Singers, Maureen Forrester, Glenn Gould, Alberto Guerrero, Elizabeth Benson Guy, Betty-Jean Hagen, Viggo Kihl, Kevin MacMillan, James Kimura Parker, Zara Nelsova, Kathleen Parlow, Jan Rubes, Leo Smith, and Elie Spivak. In 1975 in a special Sunday afternoon concert series Anton Kuerti presented the complete cycle of Beethoven piano sonatas. At the 500th concert, 26 Feb 1989, the Orford String Quartet performed works by Haydn, Beethoven and R. Murray Schafer. Sunday afternoon concerts featuring accomplished artists have continued the tradition in the Great Hall. Student and professional musicians have given informal noon-hour and afternoon recitals in the music room and the east common room. The Conservatory String Quartet gave performances on the Hart House Viols, a chest of six viols purchased ca 1930 by the Massey Foundation and the Arts and Letters Club. 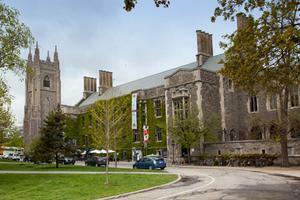 The viols became the sole property of Hart House in 1935 (see Instrument collections). Their use was restricted to experienced 'string musicians for rendering music appropriate to them'. They were used by the Toronto Renaissance Quintet, led by Wolfgang Grunsky, and by the Hart House Consort, led by Peggie Sampson. The viols, still owned by Hart House in 1990, were not in playing condition. In 1995 a decision was made to restore and conserve these instruments, and on 20 May 1999 an unveiling ceremony took place at the Gallery Grill (antechamber to the Gallery Lounge). The viols have since, again been selectively used for concerts. In 2009, Joëlle Morton was engaged as viol consultant. Beginning in 2010, students in the Faculty of Music Consort have used them in rehearsals which are often open to the public. While there was an early reluctance to include jazz in the music programs at Hart House, by the late 1950s regular jazz concerts had been initiated, and among the noted artists who subsequently appeared were Moe Koffman and Oscar Peterson. In 1958 the CBC began to tape concerts in the Great Hall for broadcast under the title 'University Celebrity Series'; these featured such performers as Rudolf Firkušný, Benno Moiseiwitsch, Andrés Segovia, Janos Starker, and Joan Sutherland. This successful series was the beginning of the continued use of the hall by the CBC. In the autumn of 1979 the music committee and CBC Toronto marked the 60th anniversary of Hart House with a series of four concerts featuring the Hidy-Ozolins-Tsutsumi Trio, Lois Marshall and Greta Kraus, Adrienne Shannon, and the Elmer Iseler Singers with the Toronto Brass. It was also the location in 1981 of the COMUS Music Theatre presentation of Graham George's opera A King for Corsica. The 450 fixed-seat Hart House Theatre, independent and under a separate administration, was used by a number of college and faculty groups, including the early Royal Cons Opera School (University of Toronto Opera Division) for operas, musicals, and plays. As music director for the theatre 1919-25 Healey Willan composed the incidental music for fourteen productions, beginning 22 Dec 1919 with the premiere of The Chester Mysteries. The Women's Musical Club of Toronto concert series was given 1929-42 in the theatre, as were the annual productions 1972-83 of the Gilbert & Sullivan Society of Toronto. The Hart House Theatre has become an important hub at the University of Toronto both for students and the community, presenting drama, dance, music and film. The theatre has featured a range of plays, that included Wingfield Unbound (2001/02), A Clockwork Orange (2004/05), Lysistrata (2006/07), A Funny Thing Happened on the Way to the Forum (2007/08), Cabaret, and The Night of the Iguana (2011/12) as well as regular staging of Shakespeare. The Soldiers' Tower of Hart House was dedicated in 1924 and a carillon installed in 1927 (see Carillons). See also Toronto Feature: Hart House.